In my previous blog, I explained what a Progressive Web App (PWA) is. Today we will dive in deeper to understand what you need to do to build a great PWA. These features are natively present in your browser. You can quickly check on your browser now which HTML5 APIs you can access. 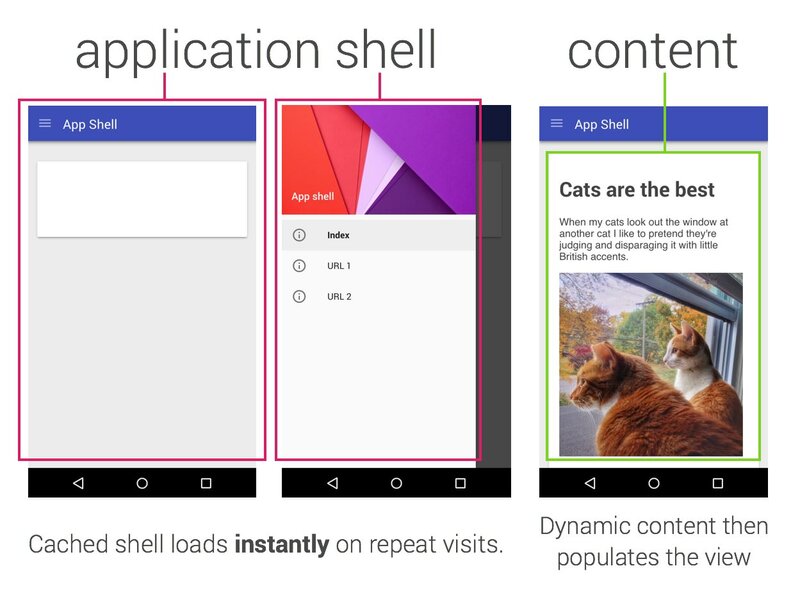 The app shell contains the minimal HTML, CSS, and key components of your application to display the basic user interface of a progressive web app. It fully separates the application UI from the data to focus on speed on the initial load. Once the app shell is defined and loaded as a first app skeleton, service workers enter the scene. Service workers are worker scripts based on promises made to let you catch events and control how network requests are handled. They are independent of your app and are often described as proxies. These workers will cache your app shell, stay independent of the network state, and will also be there for managing background content updating and content caching. When offline, the user will browse the cached data while waiting for connectivity to retrieve the latest data from the server. The icing on the cake is that they will also manage the web push notifications. The next step is to define your application manifest to control the way you engage users. The application manifest is a JSON file where you define the icon and name of your app for the user home screen, define the splash screen while resources are downloaded or restored from cache, set a theme color, specify the initial orientation of the page, and even remove the browser search bar to improve the native application feeling. Your web application is almost ready. One last key point to ensure is that your PWA is safe and secure for your users. They need to be served from a secure origin by using HTTPS. Et voilà! You now have the key to build a great, safe, connectivity-independent, always up-to-date and memorable application. It’s time to code now! I’ve gathered the best links to help you start building your own PWA. Have fun and share your experience about PWA with us on Twitter!